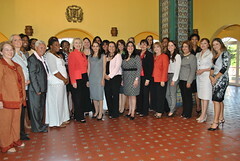 The Department of State has long supported women entrepreneurs. The Pathways to Prosperity Women Entrepreneurs Mentoring Network has become a signature initiative of that commitment. The Pathways to Prosperity initiative links together countries in the Americas to identify policies and programs that ensure all citizens share in the benefits of economic integration and globalization. One of the key objectives of the Pathways to Prosperity initiative is to foster entrepreneurship and to empower women, small businesses, farmers, youth, and vulnerable groups to participate effectively in the global community. Countries participating in Pathways have placed a particular focus on promoting women’s entrepreneurship. (…) to achieve the economic expansion we all seek, we need to unlock a vital source of growth that can power our economies in the decades to come. And that vital source of growth is women. With economic models straining in every corner of the world, none of us can afford to perpetuate the barriers facing women in the workforce. Because by increasing women’s participation in the economy and enhancing their efficiency and productivity, we can bring about a dramatic impact on the competitiveness and growth of our economies. Because when everyone has a chance to participate in the economic life of a nation, we can all be richer. More of us can contribute to the global GDP. And the gap between the developed and the developing countries would narrow significantly as productivity rises in economies from Haiti to Papua New Guinea. Building on the fact that women are drivers of economic growth and prosperity, the International Visitor Leadership Program at the U.S. Department of State’s Bureau of Educational and Cultural Affairs brought 40 women entrepreneurs from 36 African nations to the United States for the second African Women’s Entrepreneurship Exchange Program (AWEP). Removing Barriers to Economic Inclusion: Measuring Gender Parity in 141 Economies. The World Bank. September 2011. The report aims to examine legal differentiations on the basis of gender in 141 of the world’s economies. In order for men and women throughout the developing world to have access to an earned income and own property, effort in a broad range of areas, from security and infrastructure to education and health is required. This entry was posted in Environment & Energy, Foreign Policy, Society & Values and tagged entrepreneurship, Gender, global, vállalkozónők, Women's Issues. Bookmark the permalink.